In the previous story I’ve detailed my odyssey to get reasonable quality data back from the Cray boot-disk that Chris have recovered. Now with the bits at hand, I can finally start poking around. So what’s on it? I knew that the disk contained OS code for the mainframe. Chris said so. But what else is there? Or more importantly, what should be there? In order to get a functional X-MP system, I need code for both the mainframe CPUs and the various IOPs (processors in the I/O subsystem). And there’s a lot of them! The largest X-MPs (model 48 for example) have up to 8 processors to worry about: four IOPs and four main CPUs. While the boot-code we have on the disk belongs to a much smaller configuration – a model 14 with only 3 IOPs and a single main CPU – that’s a lot of code to find. Using a maintenance computer (which already got magically booted somehow) you loaded the boot image of the first IOP from tape into something called the ‘Buffer memory’; a large, shared piece of memory in the IO subsystem. After loading the boot code you released the first IOP from reset. Coming out of reset, one of the IOPs I/O channels is configured to DMA the first 128kByte from the Buffer memory to I/O memory (which is the main memory for the IOPs). When that was done, an interrupt was raised which started the execution of instructions on the IOP. The first booted IOP was responsible for loading the boot-image into the other (up to three) IOPs and starting them. Once the full IO subsystem was operational, you could finally load the boot-code into the mainframe, release one of it’s CPUs from reset, which then was responsible for system initialization and starting up of the rest of the mainframe CPUs. Wow!! This was easy, I though. I didn’t have any documentation for the X-MP IOPs but I did for the Cray-1S version of them. I could only hope the two versions were similar. I quickly wrote up an IOP dis-assembler to be able to look at the content of the file. The first attempts were rather discouraging. You see, what I expected at the beginning of the boot image was some executable code (the IOP started execution at address 0 after reset), doing some startup initialization, like clearing the registers, doing memory tests, setting up interrupts, the usual stuff. 0000000160: 00 00 00 00 00 00 00 00 │ 00 00 80 21 80 21 80 21 €!€!€! 0000000170: 80 21 00 00 00 00 00 00 │ 00 00 00 00 00 00 00 00 €! 00000001C0: 45 4C 2C 20 56 45 52 53 │ 49 4F 4E 20 34 2E 32 2E EL, VERSION 4.2. This is gibberish. The first four instructions are ‘PASS’, which stands for no operation. The next two set the ‘C’ (carry bit) depending on the ‘done’ bit of certain I/O channels, but the channel numbers 0515 and 0520 are invalid. OK, so things aren’t as simple. Maybe there’s some header before the boot-code? Maybe the first few bytes describe file size, file name, attributes of sorts, and the real code starts afterwards? There are two options here: either this is in fact the boot-code, but the IOPs are significantly different between the Cray-1S and the X-MP systems, or this is not the boot code I’m looking at. The Overlay Number field contains the index of the overlay and it’s MSB bit set if the overlay contains data. If it’s code, the MSB bit is cleared. I don’t know the meaning of the Flags field at the moment. The file-size field includes the size of the header as well as the size of the file content and is measured in 16-bit quantities. Now we’re getting somewhere! I can walk this chain, split the files into individual units and try to find the real boot code! Well, it turns out, the structure contains more than 400 files, none of them bigger than a few kilobytes. Nothing that’s even close to the expected 128k in size. It didn’t make too much sense at first what was actually going on in the code, but it at least looked like a reasonable instruction stream, with no undefined instruction codes, obviously invalid parameters or jump targets. By the way, I’ve found a second copy of the overlay structure on the disk. It’s not identical to the first one, but pretty close. It seems that some parameters got changed and the image got re-compiled at some point. It started at 0x4fb000. So far so good. It’s nice to have two sets of overlays, but it doesn’t help much unless I can get the rest of the image. So I kept looking. Let’s see what it does line by line: the first instruction is a jump, targeting address 3. So it jumps over the next two instructions, which would rely on the value of the operand register 52 (OR). After that, it zeros the accumulator (A = 0), loads this zero value into operand register 0 (OR = A) and jumps to address 0x41e4 (P = OR+16868). This is very promising. I’m not sure why it jumps over a rather large portion at the very end, but at least it makes sense as a boot code. For example, it doesn’t make assumptions about the value of the registers (OR[x] is one of the 512 operational registers). What happens here is the following: first, the value 10 is stored in OR. Than, the value of OR (the last operand register) is stored at the address pointed to by OR, which is 10, and is consequently in the memory region we’ve jumped over. After that, we set up a loop that goes from 1 to 511 (you’ll see in a minute why) with the loop counter in the ‘B’ register. In the body of the loop, we simply set OR[B] to zero. The reason the loop terminates after B reaches 511 is that B is a 9-bit register, so it rolls over to 0. After the jump happens at address 0x41EF for this last time to 0x41EA where we see A = B. So A gets zeroed out as well. The jump at address 0x41EB is a conditional one, it only executes if A = 0. The condition is now true, so it jumps to 0x41F0, past the end of the loop. Things start to make sense. 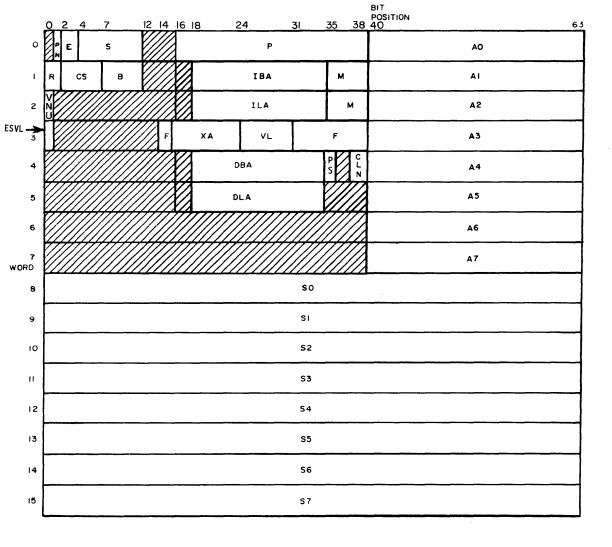 Apart from the strange saving of OR to address 10 all the code did so far was to set the processor into a known state. This in fact feels very much like the boot image!! Great. So we have one IOP boot image. Two more to go (remember, this Cray configuration had three IOPs). Except they are nowhere to be found. I’ve searched and searched the disk over and over again, but I couldn’t find anything. Well, at least I can boot one of the IOPs, and see where the boot process takes me. So, what else is on the disk? ; Set up CH8 to receive 30 bytes and store them at address 0x8DA. ; 0x982 (CLT, Channel Limit Table) tables respectively. ; Wait for an interrupt. What the code does in essence is to zero the real-time clock, set up a transaction to receive some data from the MIOP (master IOP) and wait for the transfer to complete. What you don’t see here, but if you read through the code that follows, it eventually becomes clear that it receives the date and time from the MIOP to set up the real-time clock of the mainframe. As this document describes, the Cray operating system is divided into three portions: the EXEC, the STP and the CSP. What in fact we’ve found under the name ‘INIT’ is the ‘EXEC’ portion of the OS. If you keep searching after the end of this image, you’ll find another absolute binary output, this time named ‘STP’, and after that, a ‘CSP’ image. So it appears we have a winner: this could very well be the boot image for the mainframe. If you compare the images, you will find some, but not terribly large differences. It seems to me that some buffer sizes are set differently between the two compilations, but otherwise both images should do more or less the same. This is almost all that’s needed to at least attempt to boot a Cray, provided through some magic, I don’t need two more IOP boot images. What’s missing is something called a ‘PARAMETER’ file that is supplied upon boot and can be used to modify certain configuration parameters of the OS. I’ve found two candidates for these, one at 0x2cd000 (for restart) and another one at 0x2ce000 (for deadstart). The difference between restart and deadstart is the following: if the system got completely powered down, than it goes through a ‘deadstart’ sequence upon startup. If the system just got resetted (that is it’s memory still contains valid information) it goes through the ‘restart’ sequence. It seems that these machines could be stopped for maintenance (for example to replace some faulty logic boards) and restarted without the currently executing job needing to be restarted. As if the system was designed to execute jobs that had a run-time longer than the MTBF of the machine. The last interesting piece of data I’ve found on the disk was something called a ‘dataset’. Datasets are more ore less the equivalents of a directory in a modern file-system. They contain data organized into files, and within the files into records. This particular dataset is quite a bit corrupted even after my attempts to recovering the disk image, so extraction of all content is not yet possible. It seems to contain a few binary images, a few jobs and additional data (probably working set for the utilities and jobs also in the dataset). Unfortunately what it does not contain is any source code or even a complier of any sorts. So where does it leave us? We have at least a partial IOP boot image, two IOP overlay images, two quite complete mainframe boot images, two PARAMETER files and some other, much less useful junk. What we’re missing is an assembler, a (Fortran) compiler, a linker and any source code for either the OS or the IOP images. It would be nice, very nice in fact to get a hold of the missing pieces, as – even if I could get the system booting with the pieces I have – the fun would really start if I could write and run my own programs on it. Still, even with what I have I have a lot of work in front of me. I have to write a complete simulator for the machine, get it debugged, and running the images I have. Plus I have to get quite literate in both the Cray and the IOP disassembly listings. Impressive work of reverse engineering on computer History. Generally you should link to bitsavers.org and this will redirect people to an appropriate mirror in order to balance the load. seems to imply that the 2nd number in the model name is the number of processors, but that isn’t true. The first number is the CPU count, and the 2nd is the number of megawords of memory. The number of IOPs didn’t affect the naming. I didn’t mean to imply that, sorry if that was how it came across. You’re right, the model number was comprised of the number of CPUs and the amount of (main) memory installed in the system.